When you visit, we ask that you confirm the location in advance. ATTENTION, - Please be careful. Chugoku Expressway you use "Route 491" from Chugoku Expressway, Ozuki IC., The road width is narrowing and it is dangerous.When coming, please go straight ahead without going ahead of the Michi-no-Eki"Kikugawa", go through Toyota Town · Michi-no-Eki"Nishi-no-ichi". 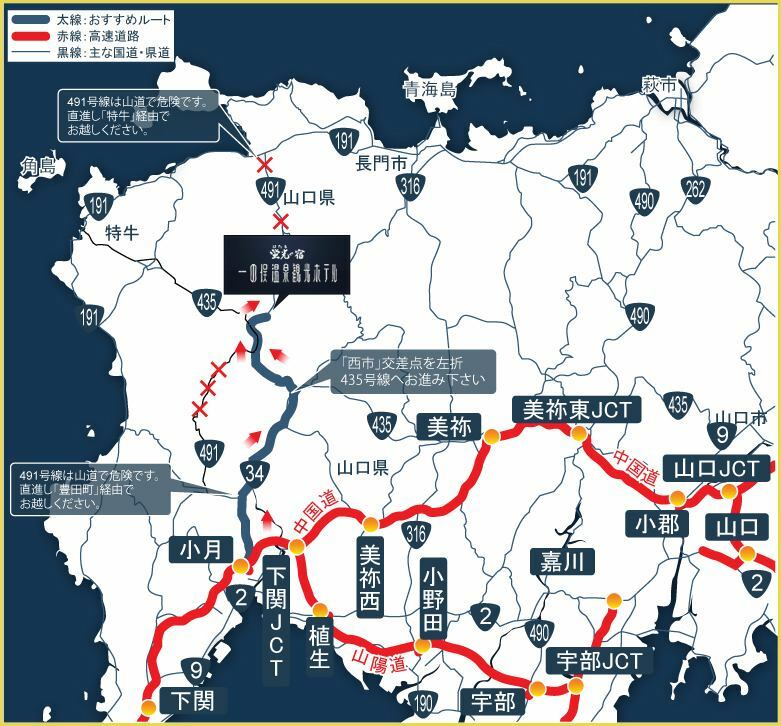 Also, when coming from Hagi district, go straight from "Route 191" to "Route 491" without going left and go through "No. 435" "Kottoi".Thank you for your consideration. From "Ozuki IC" to "No. 491", which is often given priority in navigation, it is dangerous and it takes a long walk to narrow the road width. The NEXCO site is useful for examining other routes. 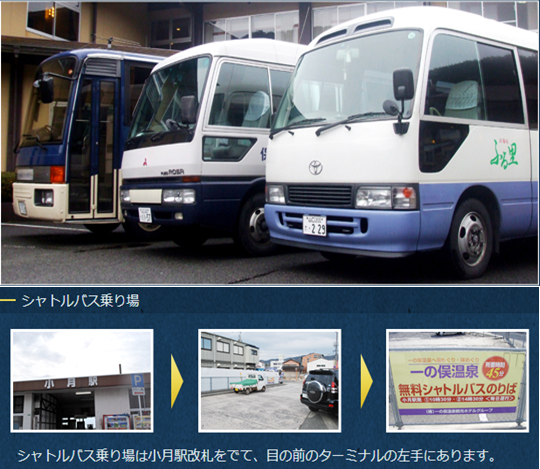 ※Free shuttle bus available from Ozuki station (reservation required) Please contact us directly after reservation. You can use it without reservation. Please use an available parking lot. At the time of crowding, the staff will guide you. Please do not hesitate to visit us by drop-in! ※For your stay, please make your reservation by the day before to make sure. ※If you do not have a reservation from 16:00 from Ozuki station it will be a forwarding bus. We are picking up and transferring to the users of the group. 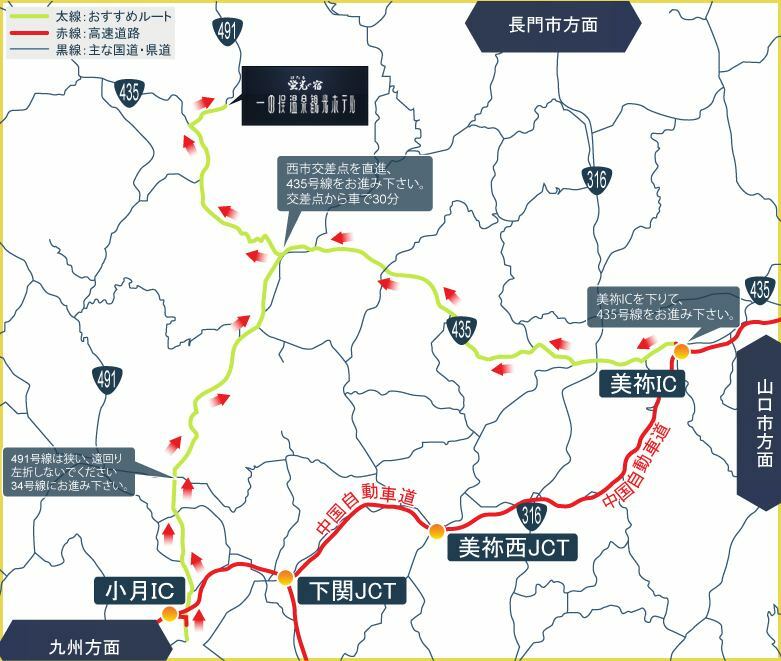 ※When using high-speed, payment of high-speed fee for two round trips is required. ※Please contact us at the time of reservation.